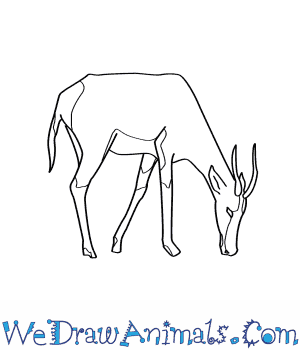 In this quick tutorial you'll learn how to draw a Blesbok in 7 easy steps - great for kids and novice artists. 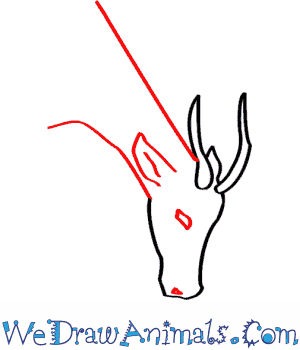 At the bottom you can read some interesting facts about the Blesbok. 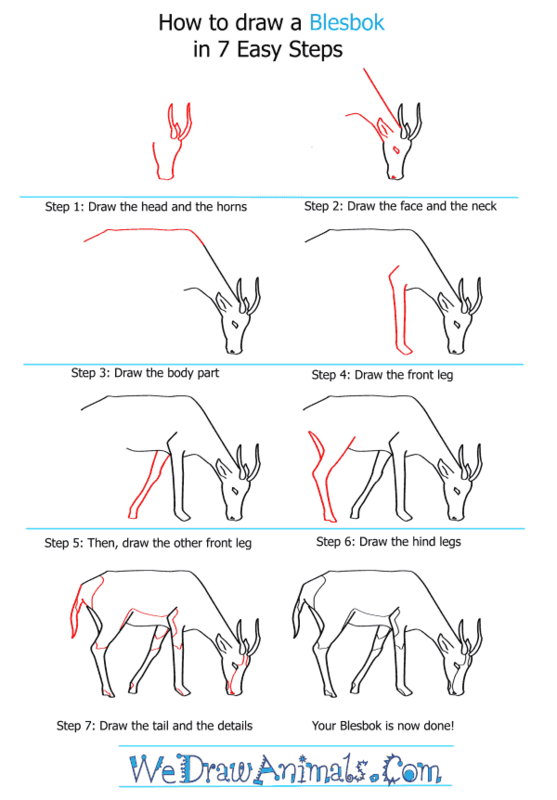 Step 1: The head of the blesbok looks like a vase. 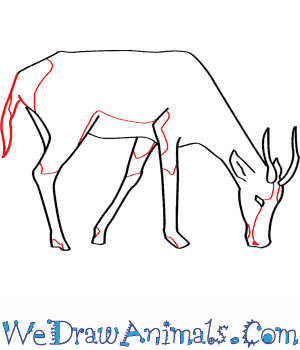 Next, draw two stick like antlers on the top of one side and an ear between them. 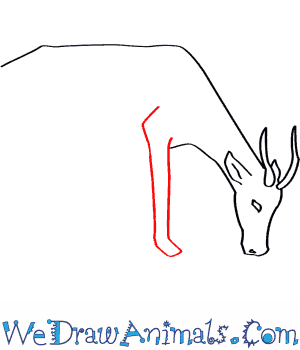 Step 2: Now we draw a straight line away from the head near the antlers to make one side of the neck, and a curved line on the other side to finish it. 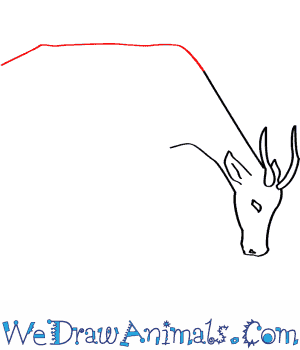 Draw an ear and add a line in the middle. Also add a dot for the nose and give it an eye. Step 3: Curve the neck line up a little and then straighten it to form the back. Bend it slightly downward at the end. 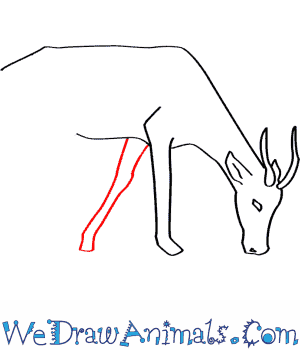 Step 4: The blesbok's legs are long and thin to help it run fast. The front leg is mostly straight lines. Step 5: The other front leg is similar, just angle it away a little to make it look like it is walking. Draw a line from the front leg across to form the belly. 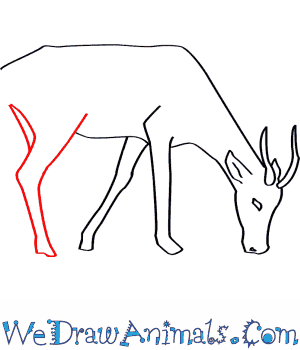 Step 6: Draw a large Y shape to make the hind legs. Add a second line going down halfway to show where the fourth leg is. 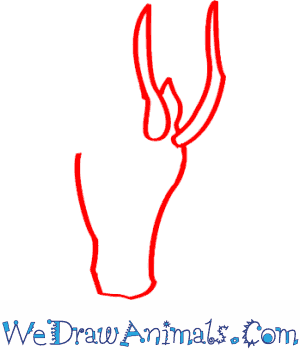 Step 7: Last, draw a tail. Then you can add some details. The blesbok gets its name from the large white spot on its head that goes from its nose up to its antlers. You did it, your blesbok is done! Blesboks are the rarest antelope in the world. They are 4-5 feet long and 2 to 3 feet tall. Their fur is dark to light brown with white patches near their legs. Both males and females have sharp black horns that jet out of the top of their heads. The horns are normally 38 centimeters long. Their bellies are white and a white patch is in between their eyes on their face. Blesbok live in South Africa they live on the plains and avoid the forests. In the 1800s it looked like the Blesbok was going to die out, but today the population is steady. In part because farmers began breeding the animals and reintroducing them to government protected lands. Bontebok and Blesbok were once considered the same animal, but in recent years, it was discovered they aren’t. They live in 2 different places. During mating season, 2-3 males will compete for 1 female. They wrestle with their horns. A Blesbok is a good runner; it can run as fast as 43 miles per hour. Male and female Blesbok stay in separate herds until mating season. Young males leave their mothers to join a herd of males at the age of 2. Young females never leave their mother. Activity: Draw an oval face mask with a notch for the nose. Then cut out the eyes and don’t forget to make horns and ears for an antelope mask. Punch holes on both sides of the mask. Tie a piece of yarn to both sides. Distribute to the students and let them color it with crayons, colored pencils, or markers. When they are finished tell them to put the mask on, when everybody is wearing their mask they are ready for the lesson.